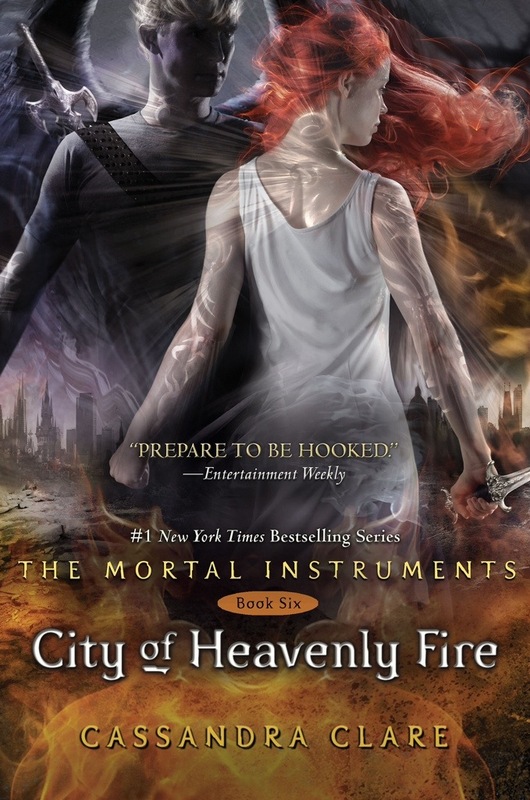 On Tuesday Entertainment Weekly’s TMI expert Breia Brissey announced an interview with The Mortal Instruments author Cassandra Clare and an exclusive excerpt from City of Heavenly Fire and now we don’t have to wait any longer. Read an excerpt from CITY OF HEAVENLY FIRE! would it be too much to hope that Sebastian dies early on? What if the death early on in the book is either Alec/Izzy… But they become a downworlder just to be with Magnus/Simon forever???!!!!!!!!!! I know 😦 but two weddings! Cassie did say Jace and Clary ‘sort of’ get married. So who knows? Maybe they will also get married. The first chapter is called Simon’s Sacrifice. LEAVE ME ALONE I’M NOT OKAY WITH THIS INFORMATION OMG. Secret TV project? Watch, I BET you it’s gonna be Infernal Devices! I swear by the Angel if it is- oh, my gosh!!!! I’m actually still hoping for a TID movie series. I know Cassie said they were possibly making them into a TV show, but a lot of TV shows I like get cancelled before they get a proper ending. So I’ll be constantly afraid they’ll cancel the show midway through the storyline.. They also tend to change the character and storyline a lot. Both the pilots For The Selection and Delirium were very different from the books. Another example is The Vampire Diaries. They even completely changed the main character in that show (personality and appearance wise). Let’s just hope Cassie doesn’t pull a Veronica Roth with this book..
AHHHHHH! I really hope not! 😀 I didn’t even think of that! You, my good women, are a genius! I’m with you, Beth, about the next wedding that should be featured! I was referring to Tessa and Jem for the next wedding that should be included! Love it! Can’t wait! So well written. A Major character dying early OMFG¿? i will ahte her if she dares to kill Simon! and they are going to another dimension, i bet they will go to the Demon`s dimension that`s been talked on the books the door that noone know where they are on the earth and only there they will fight the last battle!…. I have a really bad gut feeling that the early death of the character is Simon, because she even said in another twitter post I think it was, that one of the first chapters is named “Simon’s Sacrifice”…. I think that Maryse Lightwood will die early so her husband will have a reason to be the new Inspector. What do you think? He wanted to be an Inspector already but then he returned home to his family. What else should be his reason to want to be Inspector again? I want this book so bad!!!!!! I need it now, this teasing is killing me. I think they’ll go go a demon realm, the void. Personally, my excitement for CoHF has faded. I used to be a diehard TMI fan, but seriously, two years of waiting has kind of killed the suspense for me. I’ll still read it to see how it ends, but I’m not feeling the interest anymore. I understand what you mean. Around March/April, I will go back and start over with City of Bones and re-read each book again. (I’ve done the entire 5 books 23 times, but each time I read them, I can’t put them down!) It has been a long wait and I have been reading other books, but I can’t wait for COHF. Try re-reading all the books again and I am sure this will spark your interest and suspense and I am sure you will fly into COHF as soon as it comes off the shelf! Honestly I don’t think Simon is going to die. I think she probably twitted that Chapter title to have us think it is Simon and they go off and kill off another character we truly didn’t expect. I PRAY I am right! Fingers Crossed!!!! Great interview abs holy crap the excerpt! Colssal showdown between between team good (jace and clary included, the shadowhunter and Sebastian and dark shadowhunter a! And two weddings?! Ones Luke and Jocelyn and maybe clace with the rube marking or malec?! They go in a new place? In the Void? In another dimension? But Jace said only demons can travel through dimension, and no one else, even warlocks. Clary might create a new rune that lets shadowhunters travel to other dimensions and the cover shows Clary and Sebastian in the demon city Pandemonium. Or mabye Sebastian can travel between dimensions because he is part demon. I don’t think the early dealth will be Alec or Magnus, because there’s a lot of excerpts that show them. PLEASE, DONT BE ALEC, OR MAGNUS!! I think it might be Alec cuz in the end of Lost SOuls, he was with maureen and I AM JUST DEAD! I’M CRYING RIGHT NOW FOR THE EARLY DEATH OF A MAIN CHARACTER!!! I GET A FEELING ITS GOING TO BE MAGNUS OR SIMON!!!!!! NOOOOOOOOOO!!!!!!!!!! I CAN’T WAIT FOR THE TWO WEDDING THATS GOING TO HAPPEN IN THE BOOK!!! :D. IT HAS TO BE JACE AND CLARY AND ISSY AND SIMON!!! THEY ARE SUCH THE CUTEST COUPLES IN THE WORLD. CAN’T WAIT FOR NOW!!!!! I MEANT TO SAY ALEC AND MAGNUS :D. CAN’T WAIT FOR IT!!!!!! BY THE HOLY FLIPPIN ANGEL CASSIE! OH MY GOODNESS!!! I don’t think I’m going to able to read CoHF. I cant handle major characters dying! What is one of the wedding’s is Alec and Magnus? Could that be a possibility? That would be soo sweet. I think that the two weddings will be Jocelyn and Luke and Tessa and Jem. I really really hope that Jace, Clary, Simon, Izzy, Alec or Magnus don’t ‘t die. Also AJHASKJSDHFHFEWEHFJfkjABFJhihfwN IM FREAKING OUT!!!!! AGH I CANT WAAIIIIIIIIT!!!!!!!!!!! We know one wedding will be Jocelyn’s/Luke’s – the second has to Clace, Maidan or JESSA!!!!! Oh my gosh SOMEONE’S GONNA DIE!!!!!!!!!!!!!!!!!!!!!!!!!!!!!!!!!! NOOOOOOOOO!!!!!!!!!!!!!!!!!!!!!!!!!!!!!! The book should be called City of Heartbreaks!!! Maybe what Cassandra means by Death of a major character is a majorly in power character like Robert or Maryse maybe because Robert wanted to be the Inquisitor that’s major and Maryse is the head of the Institute that’s Major to. Two Weddings I can’t wait! I think it might be Jem and Tessa and definitely Luke and Jocelyn! May 26 can not come fast enough! LOVE IT! LOVE IT! LOVE IT! look, clary is wearing a white dress, that means one of her family will die… It can be Luke if jocelyn gets married first (he would be his godfather), or jocelyn, or jace if she gets married with im first. Well one possibility is that one of them could become a vampire. I am totally okay with Izzy becoming a vampire because then she and Simon could be an excepted relationship!!! Haga dolor en el pecho se automedique con carnitina , sin embargo.